was enthralled by EXIT THROUGH THE GIFTSHOP, a documentary on the lines and rules separating graffiti, street art and commercial art. directed by the highly regaled street artist, banksy, who himself questioned the popularity of his works in the art world. he asks videographer thierry gueta to released his extensive video footage on graffiti and really show that “it’s not about the money.” rules are made to be broken, especially for these artists who ply their trade in the night but one guy really turned the whole thing around. the film is hilarious and inspiring, the twists very smart and in the end you dont really know who or what you are rooting for. what defines an artist? who says you are one? the art world? yourself? his peers? this documentary is just awesome! in parts i began to question my own brand of art and then the film peels through another layer of the complexities and im taken into another roller coaster ride. critics questioned its authenticity, noting that thierry’s mr. brainwash was also banksy’s own makings. either way, it made for great entertainment and understanding that most of it is real. maybe. 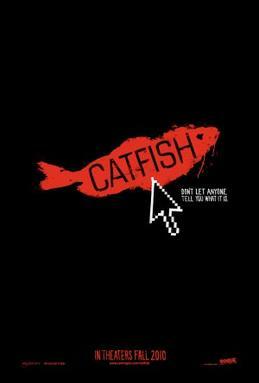 after this movie, we then watched CATFISH, another documentary whose review i stumbled upon in the new york times. i got intrigued and didnt bother reading the rest of the writeup. words with “facebook” and “better than” got me at hello. it started off pretty decent, introducing us to nev, a hairy photographer, whose photos became inspiration for a young girl artist. his correspondence with this girl and her siblings on facebook became some sort of relationship with the whole family. whatever else happened afterwards i will not be telling you because you gotta see this for yourself. rollercoaster ride! awesome movie, watch! *** a bit of a spoiler here, but, read on if you like. it was serendipity, i guess, that we chanced upon GIFTSHOP and CATFISH one after the other. for CATFISH, we are introduced to an artist who lived in a small town hidden away from the world. no hope of leaving, no opportunities for recognition and fortune. it’s not really fame we are after, artists just need a little bit of acknowledgement for our existence and expression. i guess the same goes for every human being on the planet. im currently in my anxiety-ridden phase on whether i should be changing careers again, stop doing production design, wanting to do other stuff, finding myself yet again. for somebody who is actually doing what he was supposed to do, im ungrateful. here’s this suburban artist who never had the opportunity to study art school or pursue dreams then starts to create an online dream life to escape from her reality. that should slap me out of my whining! bianca balbuena and i got to talking about this world we live in. there is a big difference between career and jobs. my ancestors took awhile before they appreciated my foray to fine arts instead of pursuing a professional course in college like architecture or engineering. we dont have jobs, we have careers. it’s not perfect but we earn a living and we dont have to slave off in offices 9-5 everyday. and we dont have uniforms! for banksy, his art got the whole world buzzing enough to raise prices on street art and elevate it from just being graffiti. do more and it becomes kitsch, as what thierry has done. but these artists had found ways to do their art and be heard, in relation to the small-time dreamer artist from CATFISH who’s missing out a lot.